Tucked away on a secluded, 100-acre peninsula on the southeastern coast of Antigua, St. James’s Club & Villas, located just 30 minutes from Antigua’s V.C. 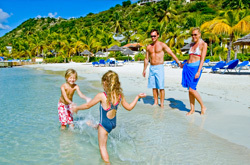 Bird International Airport (ANU), is ideal for family getaways or romantic retreats. The combination of the island’s atmosphere with the resort’s luxurious amenities and activities makes a one-of-a-kind Antiguan experience for vacationers. For on-property dining, both all-inclusive and European plan options are available. Read More. 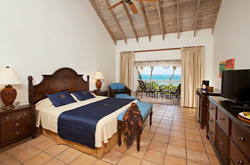 St. James’s Club offers a total of 247 Guest Rooms, Suites & Villas. Perfect for honeymooners, the luxurious Royal Suites feature spectacular waterfront views of tranquil Mamora Bay and offer concierge check-in service. The 1,600 square-foot air-conditioned 2-Bedroom Villas are a great choice for couples, families and groups who enjoy a sense of space. Club Rooms, Premium Rooms and Beachfront Guest Rooms are housed in one, two, and three-story buildings with ocean or garden views. Read More. With a games pavilion, six tennis courts, two beaches, six pools, a Kidz Club and a spa & salon, St. James’s Club offers a diverse selection of activities from which guests can choose. Complimentary non-motorized water sports include snorkeling, windsurfing, Hobie Cat sailing, pedal boating, stand-up paddle boarding and kayaking. Diving, including scuba instruction, is available from the resort’s on-site Dive Shop. Off-property excursions such as deep sea fishing & island tours can be arranged with Guest Services for an additional fee. Read More. St. James’s Club features four restaurants, plus a beachside grill on Mamora Beach. Rainbow Garden is set amidst the resort’s tropical gardens and is open for breakfast and lunch daily as well as for dinner on select evenings. Both buffet and a la carte choices are available. Children’s menus & options are available at all restaurants. Coco’s Restaurant & Bar offers a casual Caribbean ambiance with ocean views and a selection of salads, soups, burgers and pastas. Afternoon tea is also served daily on the Reef Deck patio from 3:30-4:30pm. The Docksider offers freshly caught seafood as well as a Caribbean buffet on Thursday nights. 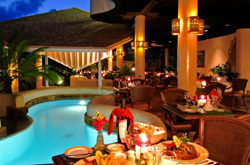 Piccolo Mondo is the resort's fine dining restaurant and offers Mediterranean and Caribbean fusion cuisine. Its romantic hillside setting provides breathtaking bay views. Read More. Tranquility Body & Soul Spa offers five air-conditioned treatment suites that offer private bathrooms and showers. Guests can also opt to receive a massage in the new open-air water view Serenity Pavilion. There is a wide selection of treatments available, including the black magma treatment, which incorporates a natural healing mud. Tranquility Body & Soul Spa features Pevonia Botanica spa products. Read More. 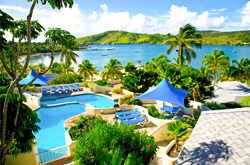 There's nowhere more fitting to celebrate a special occasion than the St. James's Club in Antigua. Its panoramic terraces, scented gardens and breathtaking beaches are all suitably romantic venues for an unforgettable wedding, vow renewal ceremony, honeymoon or anniversary trip. Read More. If you require any booking assistance, including air-inclusive packages, please visit our website here or call 866-237-2071.